In absence of the performer an assistant vanishes a picture of an Elephant from inside two boards. But the elephant is discovered by the audience hanging under the tray due to foolishness of another Assistant. The performer then enters into the stage to control the situation. 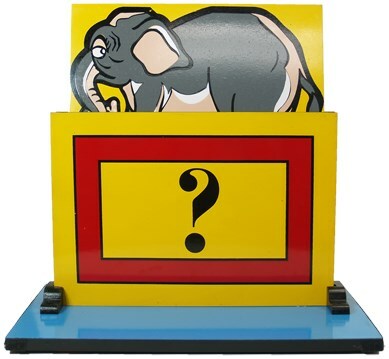 He vanished the elephant, but the foolish assistant exposes the elephant hanging under the tray. Finally the performer takes the tray and vanishes the elephant successfully.